Welcome to the YGWM project's homepage ! Here is a little video demo of the window manager's features in action. 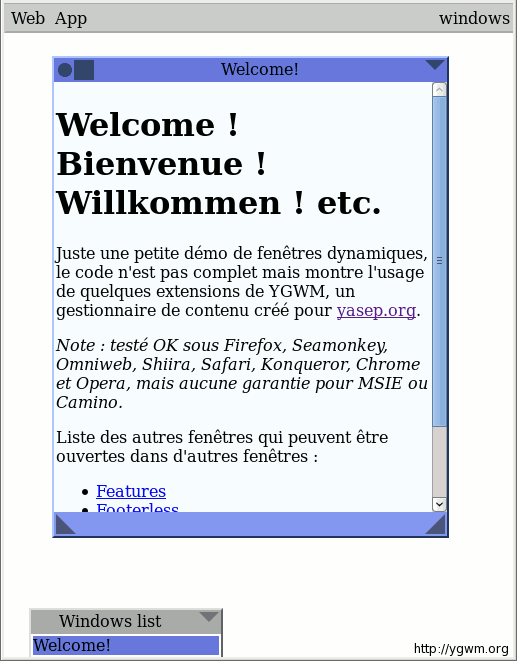 It was created in 2009 for the YASEP project's website. Here you will find the source code, API, examples and tutorials so you can use it in your own projects. YGWM offers more than fancy minimalistic windows. It provides services such as themes, uniform drag-and-drop or data entry, minimisation and compaction of the whole site, internationalisation (language picker), file save and load, cookie management, an unbounded virtual desktop, a system of "keys" to call windows from anywhere, custom hyperlinks and quite a few other gadgets... It's like a browser in your browser yet it remains space-conscious, making it load and run fast! YGWM is Free Softwware ! It is available under the GNU Affero GPLv3 license. Basicly, you may use it as long as the whole website's source code is available for download. YGWM ranked 2nd ex-aequo at the Open World Forum Code Contest in Paris in september 2011.
ygwm.tgz contains the whole site so you can use the files on your own computer. Actually Gwm is the dative form of Cwm, which means the Valley. "Y cwm" would be "the valley"
"o gwm" would be "to the valley". Most welsh speakers would probably understand y-gwm as y-cwm.